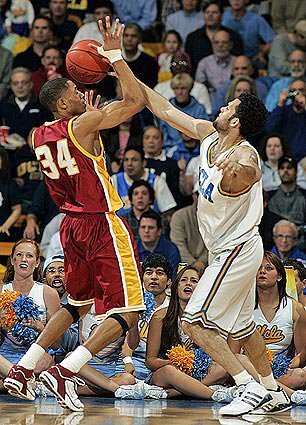 Jordan Farmar came out firing to start the game, scoring 9 of his 15 points to key an 18-2 run as the Bruins trounced the Trojans 66-45 before a raucous crowd of 13, 307 at Pauley Pavilion. The No. 16 ranked Bruins (15-3, 5-2) dominated the Trojans (12-6, 3-4) from beginning to end. After Farmar shot just 1-7 in a loss to Washington last week, coach Ben Howland lamented how the team needed him to score more; and Farmar responded with 15 points, 6 assists, 5 rebounds. He made 3 of 7 three-pointers. "Jordan is one of our top scorers. When he's in double digits, this team is going to be that much better," said backcourt mate Arron Afflalo. After giving up huge leads in each of their last two games, UCLA coach Ben Howland wanted the Bruins to play with intensity on both ends of the court for an entire 40 minutes. Although the Bruins played well offensively, they won this game on the defensive end. The Bruins maintained their defensive pressure throughout the game - never letting up. UCLA went into halftime with a 39-19 lead and never let the lead go below 20 points the rest of the game. UCLA limited the Trojans to just 27% FG shooting in the first half and a season-low 29% for the game. The Bruins pressured the Trojans perimeter players throughout the game and contested every outside shot. The Trojans shot only 1-9 from 3-point territory. The Trojan’s “big three” of Gabriel Pruitt (16.7 ppg), Nick Young (17.3 ppg), and Lodrick Stewart (12.6 ppg) were held to a combined 16 points for the entire game. Sophomore guard Arron Afflalo locked down Pruitt holding him to 1-9 shooting and only 4 points. Pruitt, an All Pac-10 player last year, never got untracked in the game due to Afflalo’s stifling defense. The Trojan’s Nick Young had improved his shot selection in previous games under new USC coach Tim Floyd, but in this game, Young appeared to play out of control and took many poor shots. The Bruin’s Alfred Aboya and Luc Richard Mbah a Moute took turns limiting Young to 3-12 shooting for just 8 points. Freshman Michael Roll played excellent defense on the Trojan’s Lodrick Stewart. Stewart finished with only 5 points on 1-4 shooting. Roll played 30 minutes and scored 6 points on two 3-pointers. On the offensive end, the Bruins executed to perfection. The Bruins assisted on 16 of their 21 field goals. UCLA shot 46% from the field. The Bruins out-rebounded the Trojans 33-27. Luc Richard Mbah a Moute had a team-high 7 rebounds in the game. Freshman Alfred Aboya was given the start at center because Howland wanted more rebounding and toughness in the defensive post. Aboya scored 3 points and grabbed 4 rebounds. Ryan Wright scored 4 points but more importantly grabbed 4 rebounds in only 12 minutes of play – his highest total so far in Pac-10 play. Senior center Ryan Hollins played his best game of the year scoring 9 points and grabbing 4 rebounds. Howland praised Hollins, "He came in the game and gave us a big lift." The Bruin centers combined for 11 rebounds in the game – a rebounding total at the five spot coach Ben Howland will gladly take every game. Since the Bruins were able to control the boards, it allowed them to often get out in transition. Interestingly for the first time this season, while on the fast-break, if the initial scoring opportunity was not available then the players were looking for the trailer, or a secondary break - a few times the Bruins even pulled up for a 3-point shot in transition. Despite suffering a multitude of injuries on the team this season, coach Ben Howland has been able to put together a winning combination of players in games throughout the season. UCLA will be severely tested this weekend when they play host to the No.12 West Virginia Mountaineers on Saturday, January 21st.